Combining Two Classic Comfort Foods Makes For The Ultimate Dinner! 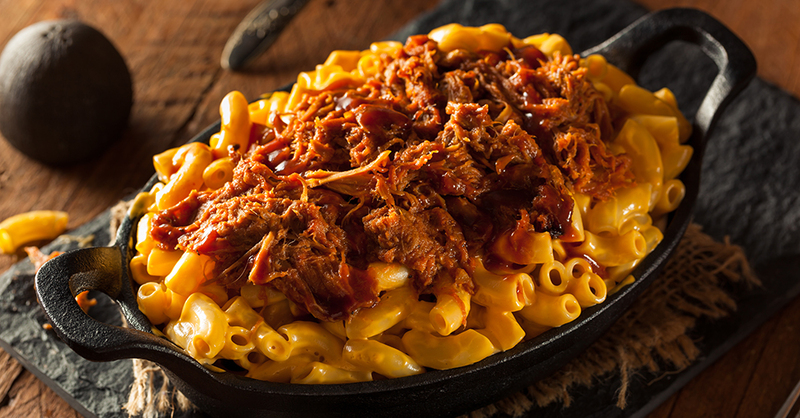 If you asked us to choose between creamy macaroni and cheese or sweet and smoky pulled pork, we really don’t know which one we’d choose…. Our family can’t get enough of either dish, but it never occurred to us to put them together until now. This dish combines all of the best elements of the two classics, as the cheesy pasta mixes fantastically with the barbecue-sauce-laden pork. If you’re hosting, you better cook extra, because your guests definitely won’t be satisfied with just one helping. Put pork shoulder and onions into slow cooker and add orange juice, spices and barbecue sauce. Cover and cook on low for 5-6 hours, or until tender. Remove lid from slow cooker and use two forks to shred tender pork. Cover again and keep on warm until ready to assemble. Bring a large pot of salted water to boil, and cook macaroni according to packaging directions, or until al dente. Once melted, whisk in flour, and then slowly whisk in milk and cream, stirring until mixture is smooth. Stir in all of the grated cheese until sauce is smooth and creamy, then stir in cooked macaroni. Serve macaroni and cheese in a bowl, topped with a healthy serving of pulled pork.